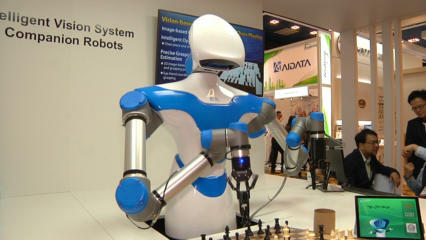 I've never played chess, but the chess-playing robot manning the Industrial Technology Research Institute (ITRI) booth at CES made it look easy. The robot uses a computer vision system as well as deep-learning features to gently handle the chess pieces and react to the moves of its human opponent. Player and robot communicate via a tablet, with the robot frequently asking for time to think before it decides on a move. The robot’s movements aren't perfect (it failed to set down a chess piece when the chessboard was slanted), but it still does really well with gripping and precise movements. During the short time I was at the booth, the robot defeated its human opponent twice. But the robot has a softer side, too: It served its opponent coffee as a demonstration of its vision system and dexterity. Though it was a bit slow, the robot smoothly filled the coffee cup on the table without spilling a drop. ITRI says it envisions the technology being used in assembly lines as well as in hospitals to care for the elderly.